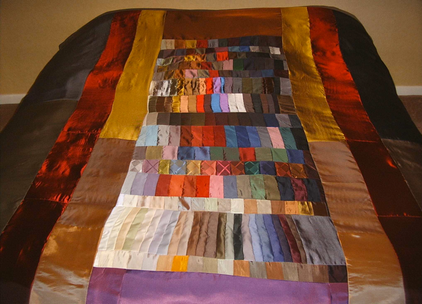 This exuberant, jewel-like quilt was an absolute bugger to make. But I love the end result, and so does the client. The real challenge was to manouever all that fabric and wadding round the sewing machine. Everything came from swatches of the rich silky material that you find inside men's jackets. I have also made more traditional granny patchwork covers from men's shirt samples and furnishing fabrics.